Increasingly, consumers are opting not to have the monthly expense of a landline telephone, but rather relying solely on their cell phones. While it does save money, it might leave these consumers vulnerable in the event of an emergency when they call 9-1-1 to summon help. The nation's 9-1-1 system was designed for landline phones, and wireless phones can present the system with some problems. The biggest issue is for systems employing Enhanced 9-1-1, or E-9-1-1. These systems are able to pinpoint exactly where an incoming call originated – if you are calling from a landline, or in many cases, a Voice over Internet Protocol (VoIP) line. It's important information if the caller is barely conscious, incoherent, or doesn't have time to give the dispatcher his or her location. According to the Ooma Institute— the non-profit arm of the VoIP telecommunications provider – the chance of emergency dispatchers being able to determine your location based on your cell phone's GPS data ranges from as low as 10% to as high as 95% nationwide. In Virginia, it says 71% of 9-1-1 cell phone calls failed to provide the caller's location. In Washington D.C., that figure jumped to 90%. The Federal Communications Commission (FCC) now estimates that some 70% of 9-1-1 calls are placed from wireless phones. The National Emergency Number Association (NENA) says consumers should understand that when calling 9-1-1 from their wireless phone, their call might not go to the appropriate emergency center, slowing response time. When calling for help from a wireless phone, the FCC advises consumers to always start by giving the dispatcher their location. Next, provide your number, in case the call is dropped. 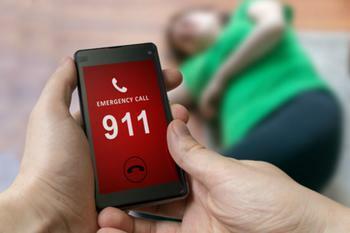 When buying a new wireless phone, ask about its 9-1-1 features. Some phones now come with better location-capable features and some providers may offer incentives for consumers to purchase them.